South Carolina’s beautiful mossy oaks are home to many communities, but it also has its apparitions. Lands End Light is said to be a small ghost light that is seen along the roadside in Beaufort, SC, on U.S. Highway 21. This 2.8 mile stretch of highway is said to be a straight road with absolutely no dips or curves, which is abnormal in itself. This mysterious orb of light is said to be the ghost of a beheaded civil war soldier. Lands End Light is a mysterious paranormal phenomena that reflects our society's fear of the unknown past and its subjective malice. 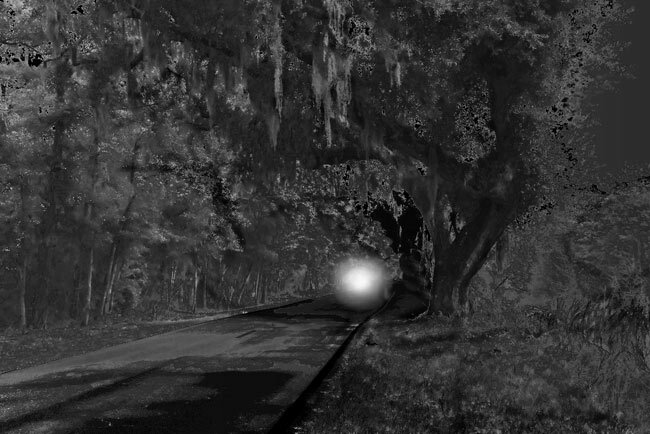 Lands End Light is a paranormal phenomena that occurs on a roadside of Beaufort, SC. On U.S. Highway 21, at the intersection of Frogmore, While parked beside a mossy oak on the right side of the road. It is said that a floating light will approach your car, until you turn the key to start your car. Nobody is sure what this ball of light resembles. Some believe that the orb is the ghost of a headless soldier from the civil war, others believe that the orb embodies the souls of women killed in the church of Ease. Two people have died attempting to chase this mysterious light. One spectating woman claimed that her hair got stiff when the orb passed her car. The road that the ghost light is seen on is 2.8 strait miles of road. There are no dips or curves on this stretch of road, that stretches as far as the eye can see. The orb of light is only seen in the darkness of night. You can only see a glowing orb in the dark. The reason why most paranormal activity intrigues is, because of the fear of the lack of sight. Society fears the unknown and some enjoy the thrill of the darkness. Most of the people who have witnessed Lands End Light have pursued the light and wished to be startled by it. Two people died in pursuit of this unexplainable light source. Similar to the dark many people are scared of the past, because of all they do not know. The past seems to fascinate and at the same time scare people. The fear of death and the gruesome ways of the past strike up the stories of ghosts in many locations, including Beaufort, SC. Some of the stories of the ghosts have been passed down through culture, but the past still intrigues the present. The locations with a large historical background tend to be full of the most ghost stories, especially in the south. Most ghost stories tend to pertain to war, because of the death and pain. In most stories, there is emotional attachment that is applied to the area. The stress of negative emotion is often applied to most ghost stories. The two stories most common stories that are applied to Lands End Light are the Headless Civil War Soldier and the dead souls of women who died within the Church of Ease. Nobody knows for sure which is more true, but the past will continue to resemble darkness because of its unclarity. Lands End Light originated due to people’s fascination with the unknown. People will continue to park their cars by the mossy oak on U.S. Highway 21 hoping for some unexplainable thrill. They may find what they were looking for; they may not. The paranormal is interesting, because of its mystery and will never cease to intrigue humanity. Chambers, Harrap "apparitions." Chambers Dictionary of the Unexplained. London: 2007. Credo Reference. Web. 11 October 2012. Chambers, Harrap "ghost lights." Chambers Dictionary of the Unexplained. London: 2007. Credo Reference. Web. 11 October 2012. "Ghost Stories of Beaufort County." ETV Low Country. NPR & PBS, 16 July 2010 Web. 16 Oct. 2012. "Lands End Light â Frogmore, St. Helena Island, South Carolina." Lands End Light. South Carolina's Information Highway, 2012. Web. 16 Oct. 2012. "Lands End Lights" Southern Ghost Stories. Tripod, n.d. Web. 16 Oct. 2012. Full summary of what Lands End Light is and where it is located. Possible stories of how Lands End Light originated.